The next edition of the Daventry Calling magazine will be delivered to households district-wide from the week commencing 24 September 2018 and will promote events taking place from the end of September to the end of November. If you have any events taking place during this time, please could you email them to us on news@daventrydc.gov.uk by Monday 23 July 2018. If you have already contacted us to tell us of an event you do not need to do so again. If your event falls before September, please feel free to send it to us anyway and we can add it to the online events page. Please also send any relevant pictures you may have – a picture from the same event last year, of the band or choir if it is a concert, or maybe a nice photograph of the venue. It all helps us improve the design of the spread. 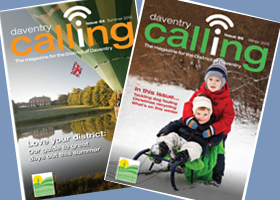 If you are aware of any areas in your parish where Daventry Calling is not being delivered, we would be grateful if you could report it to us by emailing news@daventrydc.gov.uk with your address (including house number, street name and postcode) of any homes which are not receiving the magazine. This will help us identify any delivery issues in your area and allow us to work with our distribution contractor to try to resolve them. We are pleased to announce that following the election we now have a full council – 9 Councillors in total. If you would like to be part of any of these teams then we would love to hear from you. All our areas of work, and budget, will now feed into these priority areas.